I have mentioned the Mounsey family several times when writing pages about Lancelot Smith of Corballis and his children in the Family Stories section of this blog. As I described in those pages, Lancelot Smith lived near Cashel in County Tipperary from about 1852 until 1871, at which time he moved with his young family to a farm in the townland of Corballis, near Donabate in County Dublin. Over twenty years later, when Lancelot’s children were getting married, it is very interesting that three of his five sons chose to marry members of the Mounsey family, who lived in Clashnevin, in the northern part of County Tipperary. Eldest son Lancelot Smith married Eleanor (Nell) Mounsey. Fourth son Thomas (Tom) Smith married Elizabeth (Lulie) Hodgins, whose mother Mary Mounsey was the oldest sister of Nell Mounsey. Youngest son Joseph Randal (Joe) Smith married Isabella (Belle) Mounsey, the youngest sister of Nell and Mary. I cannot explain what was the reason for this close marital connection between the Smiths and the Mounseys. The Smith men, living and growing up near Dublin, would have met many other people so it wasn’t lack of choice in finding wives. I assume the two families kept in close touch over many years and they must have found much in common in their social values and ways of living. Both Lancelot Smith and John Mounsey were farmers from northern England, were about the same age and had moved to Tipperary around the same time. What do I know about the Mounsey family of Clashnevin? Until about six months ago, I would have had to say “not very much”. However, since then I have been fortunate in receiving very useful information from a modern-day Mounsey descendant living in England. I now know that the Mounseys came from Westmorland to settle in County Tipperary in the second half of the 1850s – probably only a few years after the Smiths moved from Cumberland to the same county. John Mounsey and his wife Mary Branthwaite were from Westmorland in the parish of Askham, which is only about 5.5 miles (9 km) south of Penrith. The Smiths came from Gamblesby, about 8 miles (13 km) north-east of Penrith, so they could have known each other before they both went to Ireland. Stephen Mounsey and his first wife Mary (her maiden name may have been Parkinson) had six children, of which John Mounsey – later of Clashnevin – was the eldest. One daughter Anne died as a child. Stephen’s wife Mary died and Stephen married again, this time to Mary Tinkler, on April 8 1854. At that time, Stephen was 53 years old and his second wife was 57. It may have been due to their mother’s death or their father’s second marriage that three of his children – Robert, Stephen and Mary – emigrated to New Zealand in the late 1850s or early 1860s. Eldest son John moved to Ireland in the late 1850s. Only one son – Thomas – stayed in England but did not live in Westmoreland until his later years. Mary Branthwaite’s family was also long-established in Askham, in the civil parish of Helton. Mary was one of at least eleven children born to John Branthwaite, a yeoman farmer, and his wife Elizabeth. John Mounsey was born in October 1826 in Setterah Park, Westmoreland, and his wife Mary Branthwaite was born in 1829 in Helton, half a mile away. They were married, probably in the parish of Askham, on 30 October 1852 and had two daughters while they were living in Setterah Park where John was a farmer. The Mounseys moved to Ireland after the birth of their second daughter in 1855. When exactly they moved to Ireland – and when they arrived in Clashnevin, County Tipperary – remain unanswered questions. The earliest mention of John Mounsey in Ireland that I have found is in the vestry minute books of the Parish of Ballymackey. In April 1861, John Mounsey was listed as present at the vestry meeting; this suggests that he arrived in the parish during the previous year. In April 1862, John Mounsey was assigned a seat in the church and listed as “Jno. Mounsey, Clashnevin”. If the Mounseys moved to Ireland in 1856, I cannot be sure they were in Clashnevin before 1861. Maybe John had another farm when he first arrived in Ireland. Another interesting sidelight on the Mounseys’ connection to the Anglican parish church in Ballymackey is that John Mounsey is not mentioned in the vestry minutes after 1870 although several Mounsey weddings took place in the church after 1870 and a number of Mounseys have been buried in the church graveyard up to the year 2001. The church building has been abandoned and is now roofless. John Mounsey died in March 1916, possibly at Ballygibbon, County Tipperary. His wife Mary had died before him, in October 1903. 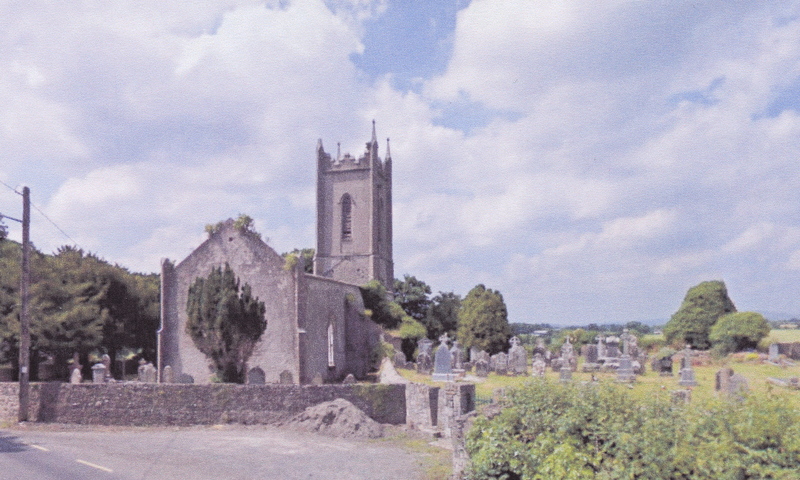 Both were buried in the Ballymackey churchyard. Mary and Elizabeth Mounsey were definitely born in Westmorland. The most tentative part of this list is the first Stephen, supposedly born and died in 1858. It would be the usual practice of the time to name the eldest son Stephen because that was the name of the child’s paternal grandfather. It would also explain why there was a later son also called Stephen if the first one died as an infant. Aside from not having any record of the first Stephen’s birth, the key question is where was he born. If it was in Ireland, as some on-line family trees say, then the Mounseys had moved to Ireland between 1855 and 1858. The next son, John, was definitely born in County Tipperary in 1859, possibly at Clashnevin. I know he was born in County Tipperary from the census records of 1901 and 1911. So I believe the Mounseys were in Tipperary at least by 1859. One thing I have learned from my helpful contact in the Mounsey family and from a couple of on-line family trees is that John Mounsey’s eldest daughter Mary was married three times. Previously, I had no idea about this. All that I knew was that she had married Robert Hodgins in the Ballymackey parish church on 13 October 1873, when she was under age, and she had a daughter Elizabeth (known as Lulie), who married my great-uncle Tom Smith. Robert Hodgins was a grocer living on Castle Street in Nenagh. His father Richard Hodgins was a farmer in the Ballymackey area so that is probably how Mary and Robert first met. From on-line sources, including census records, I have learned that Mary had five surviving children in her first marriage to Robert Hodgins. Elizabeth was born in 1874 and Robert, Mary, John and Stephanie followed her, probably in that order. Most of the children were born in Nenagh, County Tipperary, although census records show that Stephanie was born in County Clare, probably in 1882. I do not know when Robert Hodgins died but it was possibly soon after 1882 because in 1885 Mary Mounsey married for a second time to John Cody from County Clare. They had one daughter Kathleen, who was born in County Clare, probably in 1886. Mary’s third marriage was in 1893 to Robert Francis Mulligan, who was from County Cavan. They had no children. Robert Mulligan was about 10 years younger than Mary, who was 40 at the time of this marriage. We can see a little bit about Mary’s later life in the available Irish census records. In 1901, Mary Mulligan was visiting some friends in Westmoreland while her husband was running a grocery store in on Peter Street in Nenagh. His occupation was given as grocer and general merchant. In 1911, Mary Mulligan was back on Castle Street in Nenagh, listed as the head of household, with her son John Hodgins and several employees. By this time, John Hodgins was the grocer. He could have been running the same grocery business that had belonged to his father on Castle Street. Meantime, Robert Mulligan was not living in Nenagh at all but was back in County Cavan, living with his older unmarried brother and two unmarried sisters. His job in the census records was given as “cycle agent”. Mary Mounsey Hodgins Cody Mulligan died in 1923 in Hatch End, Middlesex, aged 70. When the 1921 census records are available, that could help to show who Mary was living with at that time. Elizabeth Mounsey, the second daughter after Mary, was also born in England but I do not know anything about her other than that she was born in 1855. Following Elizabeth was Stephen, possibly born in 1858 in Ireland but who must have died as a child because there was a second Stephen later on. The Mounsey household at Riverlawn also seems to have included an older unmarried sister of Georgina’s called Annie Stanley. John Mounsey died in January 1937 at Riverlawn while his wife Georgina continued living until December 1962, aged 93. Both were buried at Ballymackey. Anne (Annie) Mounsey followed her brother John in the Mounsey family. She was born in 1861. Annie married John Hegarty who was a travelling salesman. They had at least one child, a daughter also called Annie. Stephen Mounsey was next, born at Clashnevin in 1864. Stephen married Elizabeth Mary McCarthy in 1898 in Dublin. They had three children, one of whom died young. The two surviving children were born in Tipperary: Thomas Branthwaite Mounsey (1899) and Elizabeth Mary Mounsey (1901). At that time, Stephen was a farmer at Knockahunna townland, in the Ballymackey area. He died in November 1929 at Beech Hill near Tullamore, County Offaly, and was buried at Ballymackey. Eleanor (Nell) Mounsey followed Stephen. She was born in September 1866, probably at Clashnevin. In 1894 Nell married Lancelot Smith of Beaverstown, County Dublin. What I know about Nell has been included in the page about the children of Lancelot Smith of Corballis so I won’t repeat it here. Margaret Mounsey is the next one in the family that I know anything about (she followed an unnamed infant who died). Margaret was born in 1870, probably at Clashnevin and remained at home until she married Frederick William Evans in 1912. They had no children. I believe that Fred W. Evans was a farmer in the townland of Ballyluskey. The Evans family was in Tipperary from the early 1850s farming in the townland of Ballyrickard at that time. Margaret was buried at Ballymackey in January 1923. Thomas Mounsey was the tenth child and youngest son of the Mounsey family; he was born in 1871, probably at Clashnevin. Thomas may have married twice; I have no information on whether he had any children. Thomas was a farmer living at Ballygibbon, Tipperary. In 1901, Thomas was living with his parents and other siblings at Ballygibbon so I assume the Mounsey farm at Clashnevin had been given up before then. Thomas’s father John was still living with him at Ballygibbon in 1911. By that time, Thomas was married. Isabella (Belle) Mounsey was the youngest of the family and she was born in 1874 – the same year that her eldest sister gave birth to Elizabeth Hodgins. Belle married Joseph Randal Smith, who was known as Joe, and what I know about them is also described in the page on the children of Lancelot Smith of Corballis. The information I have gathered about the Mounsey family is fragmentary and has come from a variety of sources. I have made some assumptions based on what I have learned but there could be errors and there are probably omissions. I would be pleased to make changes in this post if any of my readers can help. I am sure there is more information that could be found or will become available in the next few years. While the Mounsey story is interesting, it is not central to the focus of my blog about the Smiths so I invite others to search for more information about John Mounsey of Clashnevin and his family. This entry was posted in Corballis, Families, Mounsey, Nenagh, Photographs, Smith, Tipperary and tagged Clashnevin, Corballis, Mounsey, Smith, Tipperary. Bookmark the permalink. Thank you – nice to read. Hope someone can give more information.